Marshall Bruce Mathers III (born October 17, 1972), known professionally as Eminem (often stylized as EMINƎM), is an American rapper, songwriter, record producer, record executive, and actor. Eminem is the best-selling artist of the 2000s in the United States. Throughout his career, he has had 10 number-one albums on the Billboard 200 and five number-one singles on the Billboard Hot 100. With more than 47.4 million albums and 107.5 million singles sold in the U.S. and 220 million records globally, he is among the world's best-selling artists of all time and is consistently cited as one of the greatest and most influential artists in any genre. He is the only artist to have eight albums consecutively debut at number one on the Billboard 200. Rolling Stone ranked him 83rd on its list of 100 Greatest Artists of All Time, calling him the "King of Hip Hop". After his debut album Infinite (1996) and then Slim Shady EP (1997), Eminem signed with Dr. Dre's Aftermath Entertainment and subsequently achieved mainstream popularity in 1999 with The Slim Shady LP, which earned him his first Grammy Award for Best Rap Album. His next two releases, 2000's The Marshall Mathers LP and 2002's The Eminem Show, were worldwide successes, with each being certified diamond in U.S. sales and both winning Best Rap Album Grammy Awards—making Eminem the first artist to win the award for three consecutive LPs. They were followed by Encore in 2004, another critical and commercial success. Eminem went on hiatus after touring in 2005, releasing Relapse in 2009 and Recovery in 2010. Both won Grammy Awards and Recovery was the best-selling album of 2010 worldwide, the second time he had the international best-selling album of the year (after The Eminem Show). Eminem's eighth album, 2013's The Marshall Mathers LP 2, won two Grammy Awards, including Best Rap Album; it expanded his record for the most wins in that category and his Grammy total to 15. In 2017, he released his ninth studio album, Revival. On August 31, 2018, Eminem released his tenth studio album, Kamikaze, to streaming services Apple Music, Spotify, and Amazon Music. In addition to his solo career, Eminem is an original member of the Midwest hip hop groups Soul Intent and D12. He is also known for his collaborations with fellow Detroit-based rapper Royce da 5'9"; the two are collectively known as Bad Meets Evil. Eminem has developed other ventures, including Shady Records, with manager Paul Rosenberg, which helped launch the careers of artists such as 50 Cent. Eminem has also established his own channel, Shade 45, on Sirius XM Radio. In November 2002, he starred in the hip hop film 8 Mile, which won the Academy Award for Best Original Song for "Lose Yourself", becoming the first rap artist to ever win the award. Eminem has made cameo appearances in the films The Wash (2001), Funny People (2009), and The Interview (2014), and the television series Entourage (2010). Marshall Bruce Mathers III was born on October 17, 1972, in St. Joseph, Missouri, the only child of Marshall Bruce Mathers Jr. and Deborah Rae "Debbie" Nelson. His mother nearly died during her 73-hour labor with him. Eminem's parents were in a band called Daddy Warbucks, playing in Ramada Inns along the Dakotas–Montana border before their separation. Bruce left the family, moving to California and having two other children: Michael and Sarah. Debbie later had son Nathan "Nate" Kane Samara. During his childhood, Eminem and Debbie shuttled between Michigan and Missouri, rarely staying in one house for more than a year or two and living primarily with family members. In Missouri, they lived in several places, including St. Joseph, Savannah, and Kansas City. Eminem uses alter egos in his songs for different rapping styles and subject matter. His best-known alter ego, Slim Shady, first appeared on the Slim Shady EP. In this persona his songs are violent and dark, with a comic twist. Eminem downplayed Slim Shady on Recovery because he felt it did not fit the album's theme. 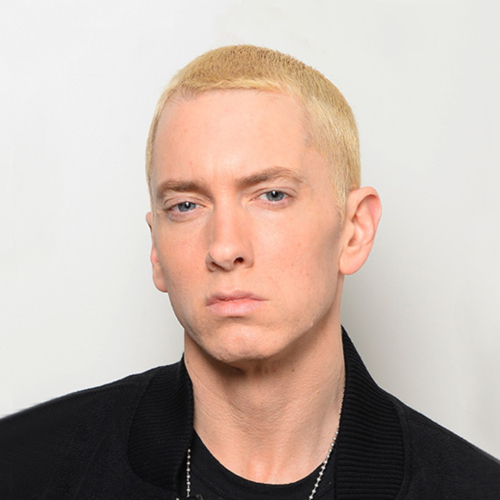 As a white performer prominent in a genre influenced by black artists, Eminem has been compared, much to his chagrin, to Elvis Presley, and as a lyricist and as aforementioned to Bob Dylan. Rapper Asher Roth has been compared to Eminem, and Roth devoted a song on his album ("As I Em") to him, which he took offense to. The accomplished trumpeter Nicholas Payton has called Eminem "the Bix Beiderbecke of hip hop". Eminem and Christian hip hop artist KJ-52 have been compared to each other, with KJ-52 called his "Christian counterpart". KJ-52's single, "Dear Slim", was controversial with Eminem fans when it appeared on Total Request Live. Although he said the song was not intended to be disrespectful, KJ-52 received hate mail and the song was number 26 on VH1's Top 40 Worst Moments in Hip Hop list.